Campione dei Campioni. Sanremo 2018 has finished after five nights of music and entertainment. 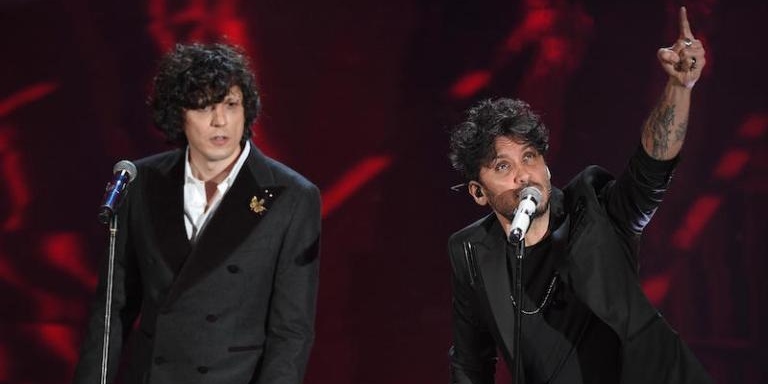 The winner of the 68th Festival of Sanremo's Campioni (Big Artists) is Ermal Meta & Fabrizio Moro with the song "Non mi avete fatto niente". Ermal Meta & Fabrizio Moro have the right to represent Italy at Eurovision Song Contest 2018 in Lisbon, and shortly after their victory they announced, that they want to go to Lisbon in May 2018. The song is written by the two singers Ermal Meta and Fabrizio Moro, together with and Andrea Febo. In the final all the 20 contestants from the former nights' competitions participated. The 3 best advanced to the Super Final and performed again: Ermal Meta & Fabrizio Moro, Roby Facchinetti & Riccardo Fogli and Nina Zilli. The winner of Sanremo 2018 was decided by 40% televote, 30% press vote and 30% expert jury. Ornella Vanoni feat. Bungaro e Pacifico – "Imparare ad amarsi"
Max Gazzè – "La leggenda di Cristalda e Pizzomunno"
Luca Barbarossa – "Passame er sale"
Diodato & Roy Paci – "Adesso"
The Kolors – "Frida (mai, mai, mai)"
Le Vibrazioni – "Così sbagliato"
Enzo Avitabile feat. Peppe Servillo – "Il coraggio di ogni giorno"
Noemi – "Non smettere mai di cercarmi"
Red Canzian – "Ognuno ha il racconto"
Decibel – "Lettera dal Duca"
Nina Zilli – "Senza appartenere"
Roby Facchinetti & Riccardo Fogli – "Il segreto del tempo"
Elio & le Storie Tese – "Arrivedorci"
The winner of the Big Artist section of Sanremo 2018 were offered the option to represent Italy at Eurovision Song Contest 2018 in Lisbon. Sanremo 2018 ran over 5 consecutive nights, and was hosted by Claudio Baglioni joined by Michelle Hunziker and Pierfrancesco Favino. The ranking for the 20 contestants was calculated based on the whole week and revealed. The Top-3 advanced to the Super-final. Top-3 performed again in the Super-final. We have a winner: Ermal Meta e Fabrizio Moro with "Non mi avete fatto niente"
Eurovision 2018 will be Italy's 44th contest. They have won twice, in 1964 with the song "Non Ho L'étà" and in 1990 with "Insieme: 1992". Worst result was in 1966 where they finished last. Italy had a long pause from Eurovision Song Contest from 1998 to 2010. Since then Italy has been a"Big-5"-country, automatically qualifying for every year's Grand Final.